The mission of Big Brothers Big Sisters of Saskatchewan organizations’ is to provide quality volunteer-based mentoring programs to youth in the province. 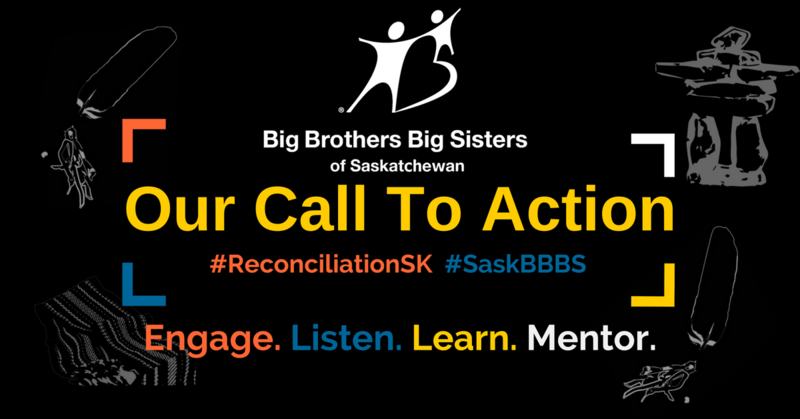 Based on this, Big Brothers Big Sisters of Saskatchewan’s partner agencies are committed to a path of on-going reconciliation with Indigenous and non-Indigenous peoples based on mutually respectful relationships within two core commitments of the 94 Truth and Reconciliation Commission Calls to Action. These commitments will serve as a framework for our organizations’ action as we move forward on reconciliation. Call to Action #7: We call upon [Big Brothers Big Sisters of Saskatchewan] to develop with Aboriginal groups a joint strategy to eliminate educational and employment gaps between Aboriginal and non-Aboriginal Canadians. Call to Action #92: We call upon [Big Brothers Big Sisters of Saskatchewan] to adopt the United Nations Declaration on the Rights of Indigenous Peoples as a reconciliation framework and to apply its principles, norms, and standards to corporate policy and core operational activities involving Indigenous peoples and their lands and resources. Big Brothers Big Sisters of Saskatchewan recognizes that these Calls to Action require us to be critical and transformative in our current practices and policies and reflective on reconciliation within all facets of our organization. Cultural competency training within all levels of our organization. Appropriate visuals and written communications reconfirming our commitment to the Truth and Reconciliation Commission’s Calls to Action. Dialogue and relationship building to ensure that our organization is receptive to the needs and aspirations of Aboriginal youth. Partnering with the Aboriginal communities and organizations to ensure quality youth mentoring in Saskatchewan. Creating culturally relevant outcomes that shift to deeper learning and effective and accountable service delivery to Aboriginal youth. Our organization recognizes that reconciliation is not an end itself but a process of change that is needed in our province. One of our reconciliation initiatives is the Saskatchewan Indigenous Mentorship Project. Our aim is to design meaningful and relevant service delivery that addresses the needs of Aboriginal youth across the province of Saskatchewan. We recognize the need to begin conversations, relationships, and partnerships with the Aboriginal community and organizations to ensure we are creating culturally appropriate services and to ensure sustainability of this project. For this, we recognize that we need YOUR help! Become a mentor within our BBBS programs: We are looking for volunteers and mentors who reflect the community that we serve. CLICK HERE! Share your thoughts: We would love to chat with everyone but especially other youth serving organizations in Saskatchewan to see if there are places that we could partner to better serve youth. Tell us where to begin: We would love to attend Aboriginal events in the community both as learning opportunities for the youth in our programming as well as places where our organization might be able to help volunteer with. Help us find the core partners: Let us know who you think would be great to begin a relationship with our organization. Donate: if you can, to this project to help create sustainability of programming in our community.